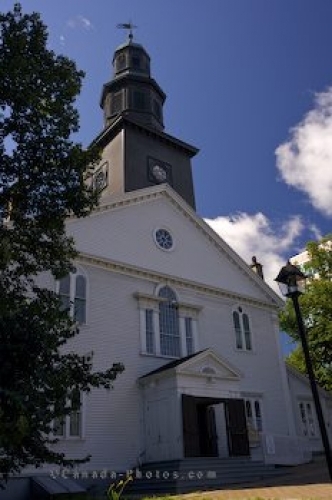 A historic building is home to St. Paul's Church in the downtown area of Halifax, Nova Scotia which has been a landmark since its beginning in 1750. As you stroll along the Grand Parade in the downtown area of Halifax, Nova Scotia, a historical building has adorned the landscape since 1750 which is now home to St. Paul's Church. Along the "Walk Historic Halifax" in the downtown core, this church is the first and oldest one found throughout Halifax. St Paul's Church, oldest building in Halifax built in 1750 - Canada's first protestant church, in the Grand Parade in downtown Halifax, Halifax Metro, Halifax Harbour, Nova Scotia, Canada. Picture of the historic St. Paul's Church along the Grand Parade in downtown Halifax, Nova Scotia.